Last week, the Civil Infrastructure Platform (CIP) Project participated in Open Source Summit Japan hosted by The Linux Foundation (LF) as a Silver level sponsor. The following article is a short recap about what we learned and accomplished during these 3 days of the conference. The event was packed! More than 1,000 people participated to the event. All sessions were delivered in English, even the Japanese developers delivered their talks in English. There weren’t any translators (except for the keynote) and this gave the event a very international flavor with many non-Japanese participants. A day before Open Source Summit started, CIP members had meetings for the Governing Board and Technical Steering Committee. Most notably, however, we had the first-ever open workshop, which was made available for anyone who is interested in the work we are doing at CIP. There, we discussed, along with the non-member participants, Real Time (PREEMPT_RT) and CIP testing. It has been a year since the inception of the project and we’ve been making a lot of progress. But, CIP is NOT the kind of project to innovate some fancy, cutting edge, newest technology. Instead, CIP is one of the most conservative projects among the 60+ projects the LF currently hosts, and we DO take pride in it. We take pride in maintaining a software that will become the backbone of our civil society infrastructures such as energy, transportation with the robustness and security level industry requires. To do that, our work needs to focus on “making the system industrial grade.” Choosing one or very few kernel versions and keep re-painting and duct taping them, as well as investing to Real-time capability, security and safety etc. As such, we did have demos that entertained the audience. Here are a few details about the CIP member demonstrations at the booth. These products are all running on the CIP 4.4 Kernel. Siemens was also planning to demonstrate the IoT2040 device that runs CIP kernel, but it did not arrive to Japan on time. We hope to see it at our next conference. There were 2 CIP-related sessions during Open Source Summit Japan. Civil Infrastructure Platform: Industrial Grade SLTS Kernel and the Base-Layer development – Yoshitake Kobayashi, Toshiba & Chair of TSC at CIP. Yoshi Kobayashi provided the basic status update of the CIP project in general. The session was well attended with more than 50 participants from different industries who actively participated in the conversation as to how CIP may solve the issues facing their companies today. The Many Approaches to Real-Time and Safety Critical Linux Systems – Wolfgang Mauerer, Siemens. While Yoshi provided the general status update about the project, Wolfgang gave an overview of architectural options for two of CIP’s focus areas, Real-Time and Functional Safety. With no seats left in the room, the topic seems to be of great interest to the community, and will likely continue to grow in importance in the future when we see more and more industrial devices based on Linux. All in all, the 3+ days in Tokyo was extremely fruitful for the CIP Project and our member companies. If you missed Open Source Summit Japan this year, I strongly urge you to try to come over to Japan to join next year. Also, the CIP Project is planning to sponsor the Embedded Linux Conference Europe (ELCE) this coming October. If you are planning to come to Prague, please stop by our booth!! The Civil Infrastructure Platform project, a Linux Foundation Initiative, is happy to announce the publication of Board At Desk – Single Dev. v0.9.1, a customised and easy to deploy instance of the kernelci.org and LAVA projects that should allow developers to test Linux kernels on boards connected to their own development machines using the tooling provided by one of the most successful Open Source and distributed testing projects. As a vagrant VM image/recipe. As a VM image, widely called box. Please visit the CIP Testing project Download page to download the first release of Board At Desk – Single Dev. (B@D v0.9.1). With this effort, the CIP project is trying to create a first step towards “shared and trusted testing” by every member and the CIP kernel maintainer. It also has as a goal to extend and simplify the current use case satisfied by kernelci.org, focusing on those embedded developers that have direct access to boards, by reducing the deployment, configuration and maintenance costs. Finally, CIP intends to increase the number of developers and organizations willing to participate in kernelci.org by providing a simple mechanism to evaluate the technologies involved in what CIP consider B@D’s upstream project. Merged the KernelCI and LAVAv2 Virtual Machines together into one. KernelCI was based on Ubuntu v14.04, it used Nginx as the Web Server and SimpleHTTPServer for the Storage Server which is where the builds are stored. LAVA was based on Debian and used the Apache Web Server and the Django Content Management System for the Frontend Web Framework. Both web servers wanted to use port 80. The current VM uses Debian Jessie only. It runs KernelCI on Nginx and LAVA on Apache on reassigned ports. The KernelCI Storage Server has been migrated over to use Nginx on a reassigned port. The released VM assumes the usage of an FTDI USB-to-Serial cable to connect the host machine to the Beaglebone Black. 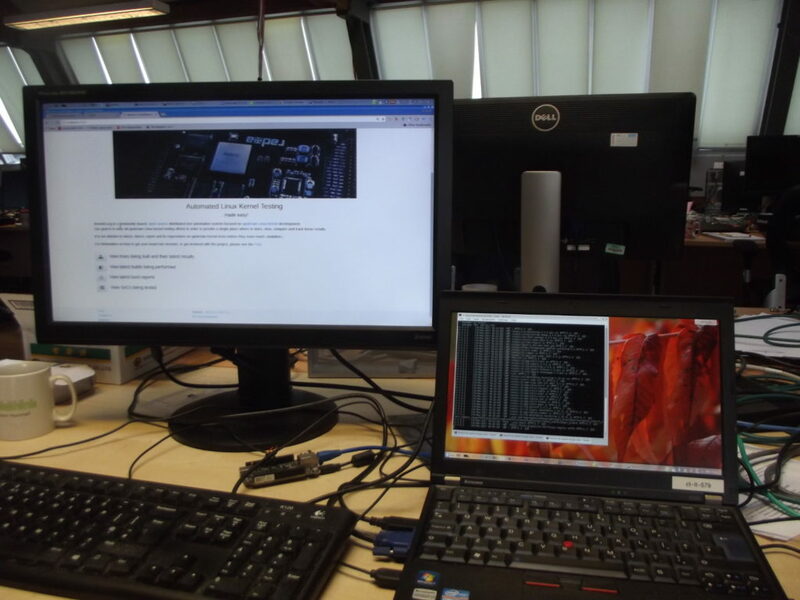 It uses ser2net to route the /dev/ttyUSB0 serial port to a TCP port on the host machine which allows the user to use telnet to communicate to the Beaglebone Black console for remote login and boot messages. It also allows LAVA to use tftp to transfer the kernel directly over to the board eMMC without needing to burn an SD Card. This B@D version supports Beaglebone Black. Renesas RZ/G1M support is in progress and the rest of the CIP reference boards will be supported in the near future. Further information about what you will find in Board At Desk – Single dev. (B@D v0.9.1) can be found in the B@D Feature Page. If you are interested in testing kernels using this version of the tooling please meet the developers at the cip-dev mailing list. If you find bugs in KernelCI or LAVAv2 themselves, please report them upstream. If you find them in the configuration or any of the previously described topics, please report them in the CIP-testing bug tracker. More general information about the CIP testing project can be found in the CIP Testing Landing Page.